The Paslode 900420 cordless framing nailer allows professionals the convenience and portability of a professional grade nailer without the hassles of a hose and compressor. Paslode cordless uses a patented fuel + battery system which results in an innovative, compact lightweight tool that deliver exceptional power and performance. The Paslode cordless framing nailer drives 2-inch to 3-1/4-inch Paslode round drive offset round head nails with .113 - .131 diameter shanks. Use Paslode red fuel item no. 816000 with the Paslode 900420 cordless framing nailer. Paslode cordless red framing fuel cells drive up to 1,200 nails per cell and the battery drives up to 4.000 nails per charge. The Paslode 900420 cordless framing nailer fits between 16-inch on-center joists, studs and roof trusses, allowing you to work comfortably in cramped, overhead and other hard-to-reach areas. Use the Paslode 900420 cordless framing nailer for building: joists, rafters, stairs, sheathing, flooring, roof decking, bridging and soffits. The Paslode 900420 cordless framing nailer is also great for service and punch-out work, the Paslode 900420 cordless framing nailer framing nailer comes with a hard-sided carrying case, 6-volt rechargeable battery, 2-hour ac battery charger, safety glasses, quick reference setup and cleaning guides. Nails and fuel are sold separately. Paslode cordless has over 20 years of experience working with professionals and responding to their demands for superior power and performance in lightweight compact size tools. 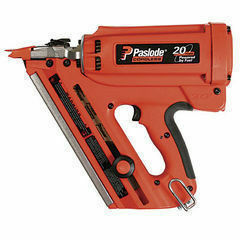 Paslode cordless is the only proven non-pneumatic option for professional remodelers, carpenters and contractors. From frame to finish, Paslode cordless offers a complete line of cordless power fastening systems to meet the needs of the professional. May not be great for production work, but for times when you can't get the compressor out, or if hoses are just too much to reach where you are working, this paslode framer will shine! This nail gun is perfect smaller jobs when it doesn't make sense to drag out the compressor with all it's hoses and cords. It isn't as fast as an air nailer when shooting multiple nails, so I wouldn't want to use it to frame a house, but it works great when your only shooting in a couple of nails then moving to the next joist when nailing deck boards. It REALLY shines when building a fence on a wooded lot. No more snags. I could have done without it. The tool works ok. I've found that if you are shooting more than a few nails you might as well get the air nailer out. It's loud and I don't like the you have to push on the work to get the gun to shoot. I don't do whole house framing anymore but I do lots of general remodeling that requires a good power nailer. Hated the noise, weight & general aggravation of air tool & compressor and as I work alone 90% of the time the Paslode seemed like an obvious choice. I've used it hard since early last summer. It has been outstanding. No complaints whatsoever regards function but wouldn't want to work all day in a closed in environment - it's a gassy little thing. I have this gun, as well as two of the previous model. It's a solid performer for punch-out work or small scale framing projects. It's great for "Grab-N-Go" projects, where setting up a compressor and hoses is not warranted. Cant imagine not havein one. Works great for small and big nailing jobs. Havent used hose gun nailers for sometime. Even use hoseless finish guns as well. Impulse can work for an Individual, but its a pain with a crew to keep running. We own about 50 Paslode nailers, but only 5 Impulses. With a crew's lack of responsibility for cleaning, making sure to have gas and a charged battery it has been difficult to keep Impulses running. This would be an excellent tool for 1 or 2 carpenters doing remodeling [who are willing to take it apart to clean it.] Do you keep your hunting rifle clean? If you are willing to clean and do preventative maintenance the Impulse will be a great remodeling tool for one or two carpenters. beats dragging hose through a beautiful home. If I worked alone remodeling the Impulse would be hard to beat. I can purchase a new air nailer for the cost of sending Impulses out for repair. Been using this gun for years. Paid for itself in 2 days. In this economy where our jobs have been cut back in scale it's a great tool. Just can't go and go and go and MUST clean regularly. I blew out one piston which is directly connected to the flat driver and 1 trigger switch in 4 years. Love it. Love it, but you must keep it clean. Beats dragging out hoses and a compressor every day. For small remodeling it can't be beat for speed and convince. I not a framing but I do some light frame work in my remodeling and this really works well! It's okay for plinking. The dewalt 20V is better and that's not saying much.